A great left-over recipe, meant to satisfy even the heartiest and fussiest appetite Adpted from a super BHG recipe. Bake, uncovered, in a 350 degree F oven for 20 minutes. Arrange baked tortilla pieces atop casseroles. Top with cheese; bake for 5 to 10 minutes more or until heated through. 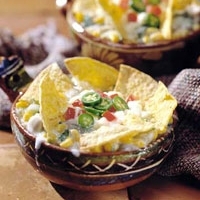 If desired, garnish with additional sour cream, jalapeno slices, cilantro, and tomato. Bake, covered, in a 350 degree F oven for 25 minutes. Uncover; bake about 20 minutes more or until heated through. Top with tortilla pieces and cheese; bake for 5 to 10 minutes more or until heated through. Garnish as above. 4. To micro-cook frozen casseroles: Cover microwave-safe casseroles with waxed paper; micro-cook on 30% power, allowing 4 minutes for 1 casserole and 5 minutes for 2 casseroles. Continue cooking, covered, on 100% power until heated through, allowing 2 to 4 minutes for 1 casserole or 3 to 6 minutes for 2 casseroles, rotating the dishes once. Top with baked tortilla pieces and cheese; micro-cook, uncovered, about 30 seconds more or until cheese is melted. Garnish as above. Make-Ahead Tip: Assemble casseroles as directed above, except do not top with baked tortilla pieces; place baked pieces in a moisture- and vapor-proof plastic bag. Freeze casseroles and tortilla pieces up to 1 month. I missed this one first time around...fabulous!! 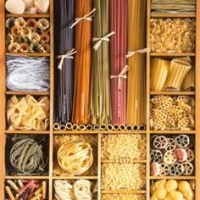 i actually had this recipe in 2002, and i lost it..now i've got it again..thanks! this is a great easy recipe. This sounds like a good one. I'm gonna have to give it a try!! Yummers, yummers, yummers. Greatness and a high 5. Right up my alley! Great make-ahead. Thanks! Nice recipe, Mystic! Thanks for sharing. You are very talented! Greeeeeeeeeeat recipe!